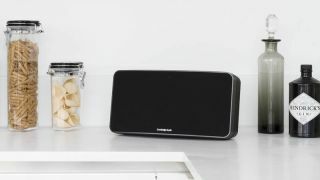 Top-tier audio brand Cambridge Audio has unleashed a trio of new wireless speakers, two portables and one high-ender for use in the home. First up is the Go, updating the Minx Go with NFC for one-touch pairing and aptX Bluetooth. You'll get 18 hours of playback time out of a single battery charge, and you can even use it to charge your phone or tablet using the rear USB port. This one will be available from September for £120/$180/AU$229 with US and Australian prices to be announced shortly. Next we've got the Go Radio, which does all of the above but adds an FM radio on top. You'll be able to switch through stations using the LED display, and beam internet and digital radio stations via your phone or tablet. Expect this one in November for £140/$200/AU$280. Last but by no means least, the Bluetone 100 is the highest-end model, and while it isn't portable it packs a fairly big punch for its size with 100 watts of amplification and a Bluetooth device range of up to 10 metres. This one's also coming in September, with a price of £200/$300/AU$400.